We have come into San Francisco for the weekend, and are staying at the lovely Fairmont Hotel San Francisco on Nob Hill. We are having a wonderful time despite the virtually constant torrential rain, although it is making sightseeing difficult. Having said that, San Francisco is a fabulous place to shop anytime, and the rain is making shopping the perfect activity! I have found some seriously gorgeous shoes and some beautifully fitting jeans, as well as a few foodie delicacies at Williams Sonoma’s Artisanal Market this morning. 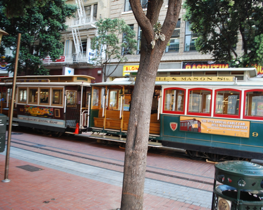 Here are some links to posts from previous visits to San Francisco, when the weather was a little more friendly for sightseeing! Wherever you are, I hope you are having a wonderful weekend!